Last night I was trying to pick a shade of purple/lilac to match this summer dress I was going to wear to work. This Zoya polish, Perrie, I had just picked up a week or so from Trade Secrets so thought it would match my outfit well. 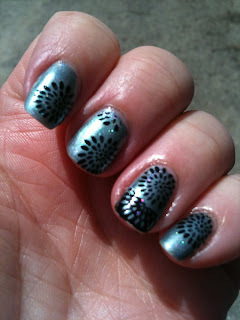 Two coats, great coverage, topped with SV. 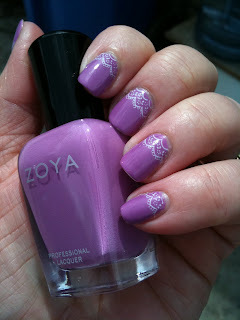 This was the first time I used a Zoya product and the results were fantastic! 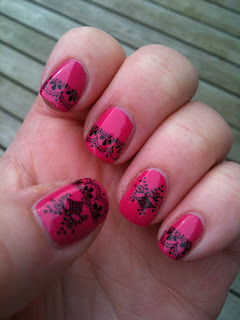 And because I'm a stamping fanatic, had to pick something to stamp it with. Konad IP m71. 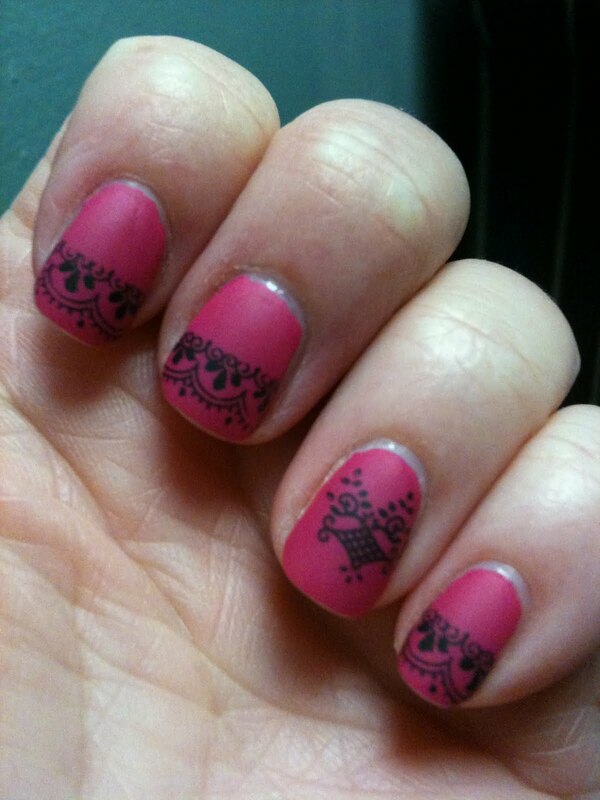 My nails are so tiny you don't really see the great effect of this stamp. 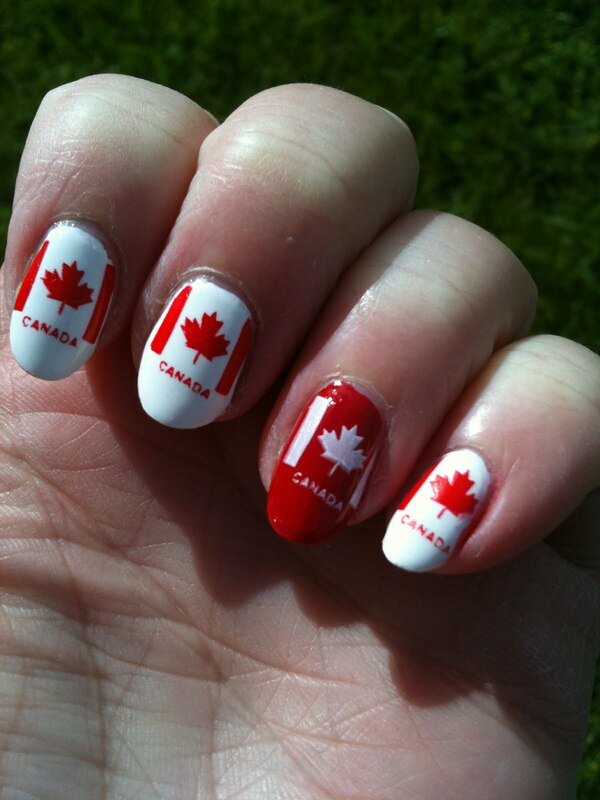 on a couple of my fingernails. Unfortunately....when the mani was finished, all I could think about was that this looks like purple Easter eggs.....I'll have to keep this in mind when Easter rolls around. I think the look of an Easter egg could be easily replicated by another band at the tip of the nail, maybe a couple of dots in between and an Easter mani is easily accomplished! 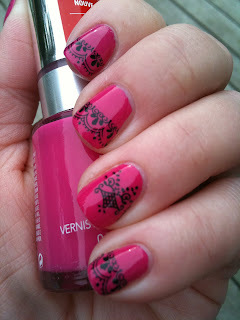 Thats what I see when I look at these nails! 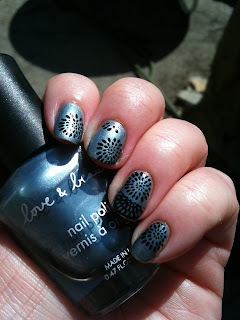 This mani is stamped Bundle Monster IP BM18 and BM 22, using Konad black special polish. I did have shrinkage on the ring finger as I used SV as topcoat over the stamping and this can happen when using it over dry polish.....I guess I'll have to learn to wrap my nails one of these days! 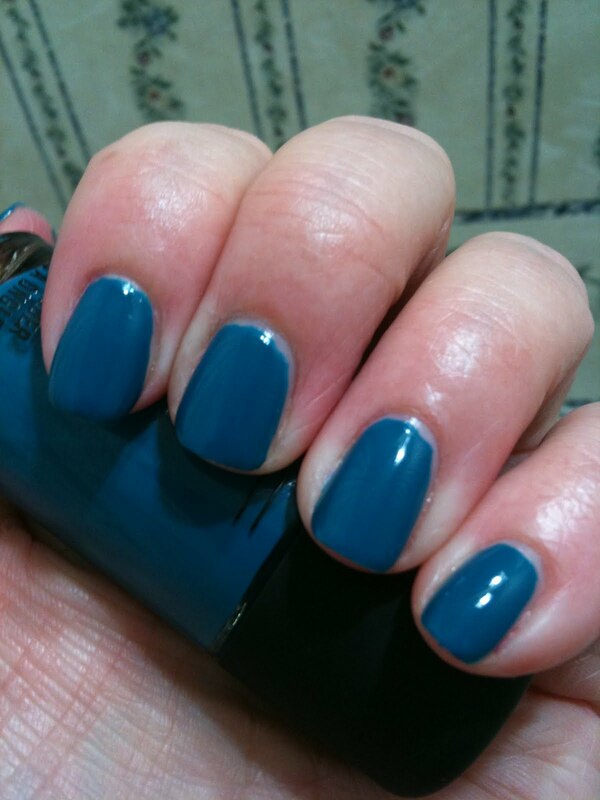 Love, love, love this colour! Alice & Olivia (for MAC) Morning After, a blue/green/teal cream polish. While one coat gave pretty good results (probably a thick one coater but I know you should do thin coats instead!) this is two coats, topped with SV. The pre-stamping photo was taken very late at night (OK-early morning) under artifical lamp lighting so a little darker than actual. 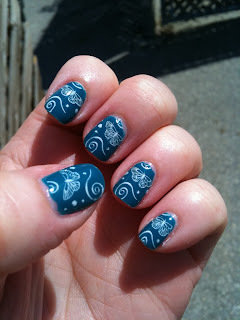 Plus as everyone knows, blues don't capture well (at least my camera) so you don't really see the teal of this polish. 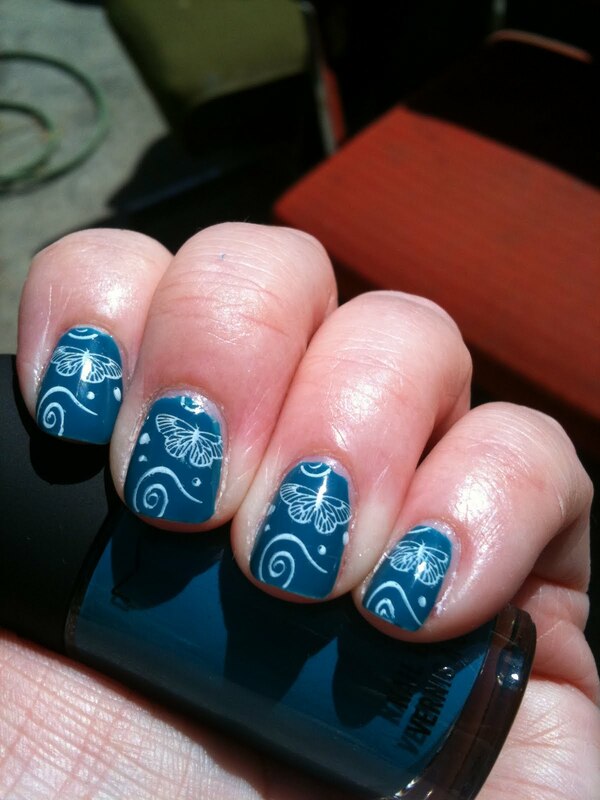 Stamped with white Konad special polish, fauxnad IP T39, then once dry, coated with one coat of SV again. I'm sure everyone knows that SV dry fast topcoat should be applied when polish is wet to avoid shrinkage; however, when using as topcoat over stamping, wait about 5-7-10 mins for stamped polish to dry or it will smear). 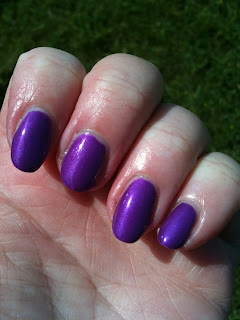 I find SV smears less than Konads special topcoat too so it it my topcoat of choice all around (I have bought Poshe which also seems to get a lot of loving on the blogs and boards but it is untried). I also got the other two polishes from this limited edition MAC collection, So Rich So Pretty and Military, but thats another day. Too many polishes, not enough time! 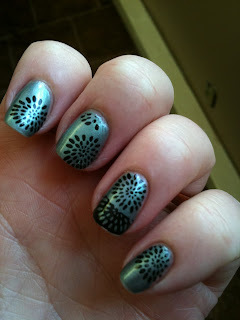 So I picked up my new Alice & Olivia (by MAC) polishes and was dying to try them out. 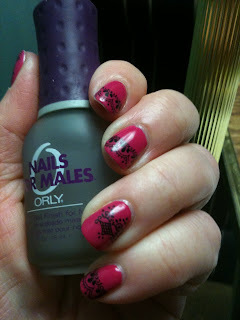 But before I did, I thought I'd play with my last mani by adding some matte finishes. I've had the Orly for Men matte product for a while and picked up Essie Matte About You as part of a two pack with Wicked. I had originally sourced out the Orly for Men matte as I had read on another blog that it sueded polishes but honestly, despite two coats, it barely took the shine off. This was the very nice compliment I got on this manicure from the cashier at MAC when I was by today picking up the new Alice & Olivia polishes that I had on hold from last week (but that will be another post!). 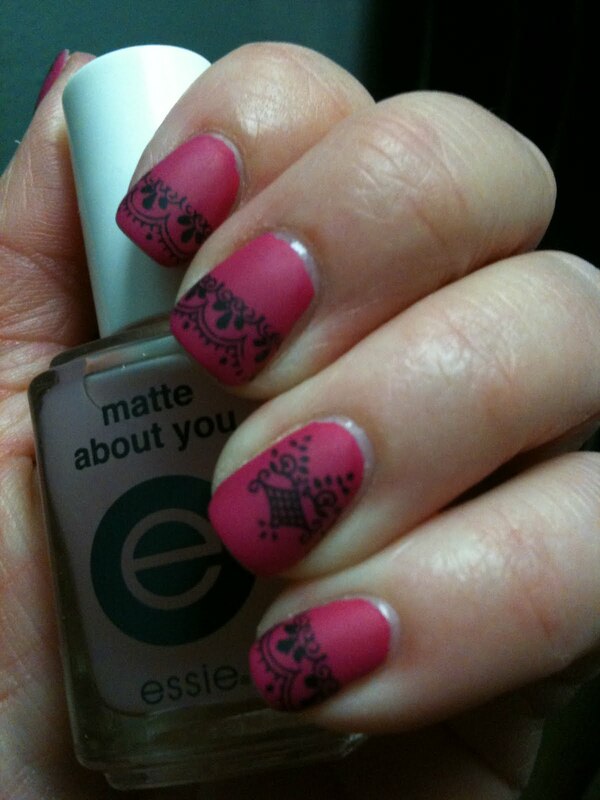 I'm guessing its because she had never seen stamping before and the fantastic results from it as there are so many more ladies out there that have much nicer nails , apply polish much better and are soooo much more skilled in stamping then I! 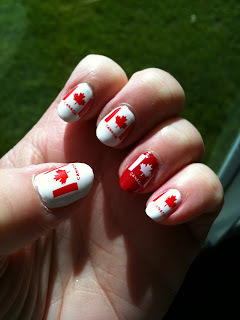 Anyhoo, on to the mani! 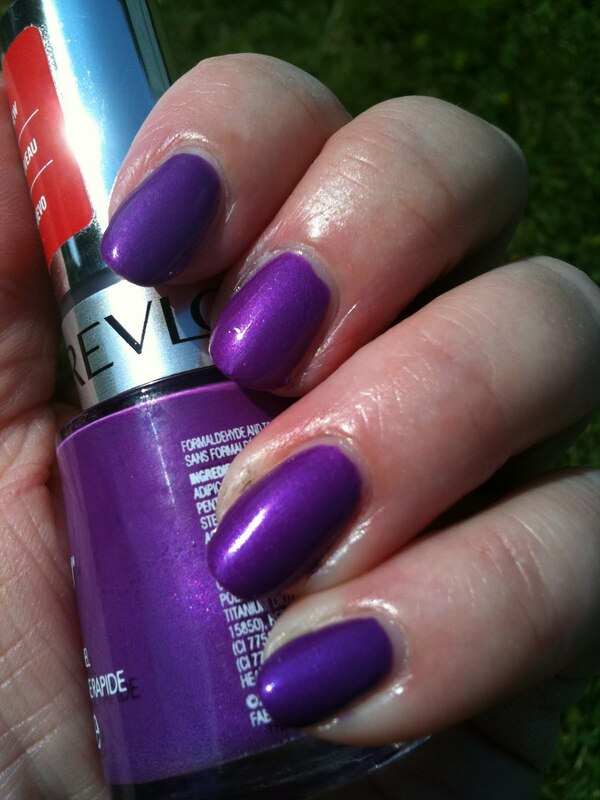 Revlon Top Speed, colour is Bubble. Exact dupe of the Revlon scented polish, colour Bubble Yum - exact but no scent. Two coats, topped with one coat SV. 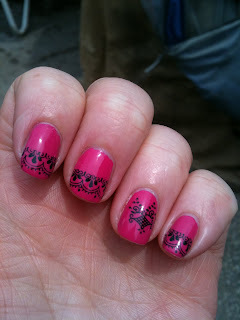 As I just got my nails filed square I also thought it perfect time to try a Konad tip stamp (well, made it into a tip stamp!) 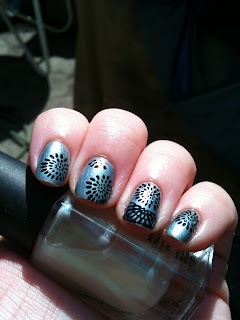 and used Konad IP m57 and m68, black special polish. 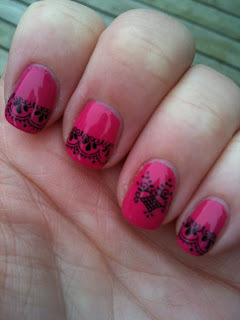 Unfortuantely, my stamping skills alluded me and not stamped very straight but not too too bad. Pictures are a little dark as it was overcast when they were taken. An no unstamped image as this mani was done in the wee, wee hours of the am while surfing the net and looking at all the fantastic nail blogs! PS: I am not conceited and I fully acknowledge that there are bloggers out there with much nicer nails and manicures than mine - just repeating the compliment! Revlon Top Speed Violet - new to Canada! I found a brand spanking new display on Friday night and of course, had to pick up a polish (or 10!) 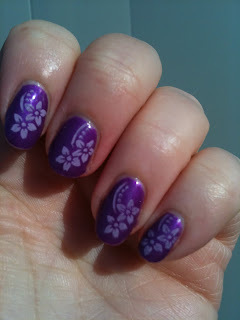 This is the first polish I wanted to try out - Violet. 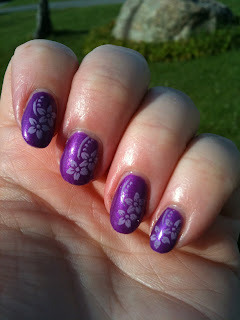 This is a bright vivid purple, similar to China Glaze Purple Panic (except not matte) and a dupe to Revlon Grape Ice from the 2010 Summer Scents (except scentless). There are actually a few dupes in these collections and they even have similar names (Bubble versus Bubble Pop) and Lagoon versus Lagoon something), but there are some new colours as the scented collex had 8 polishes (I believe) and this one has at least 12. 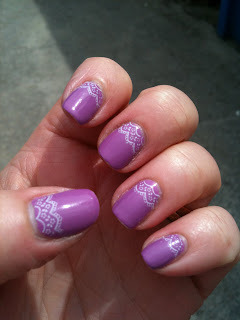 Two coats and later stamped with light purple Konad special polish, GCOCL fauxnad IP E02. O, Canada! My True and Native Land! I am a very proud Canadian and what better way to show off my heritage, and love of my country, by doing a Canada Day manicure! 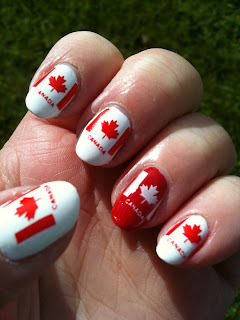 I got a lot of compliments at the Canada Day celebrations I attended. 100's of red and white balloons were released and after, everyone had strawberries and ice cream! This is three coats of OPI Alpine Snow Matte, topped with Seche Veche, then stamped with Konad Special Polish, Red and White. 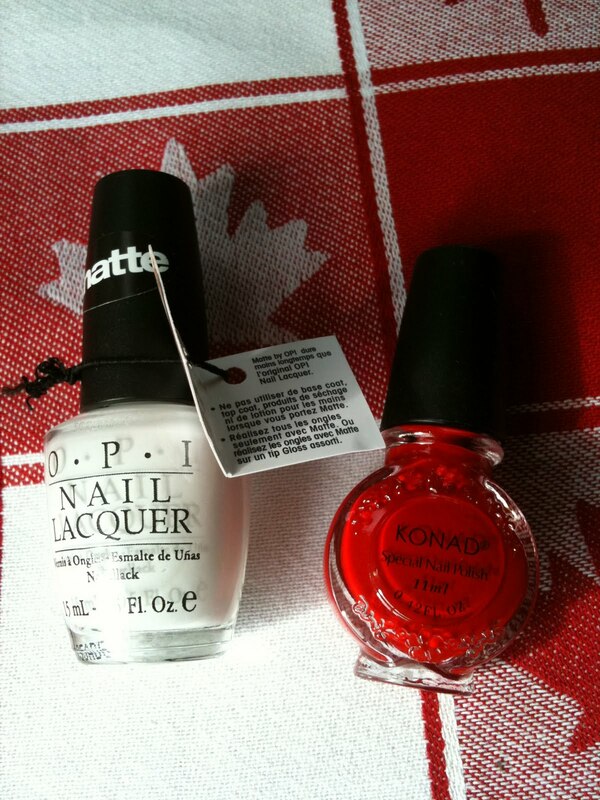 The red polish is Sally Hansen nameless red, marked 60, and fauxnad image plate m56. I'm sorry for posting this after the fact but had busy long weekend!